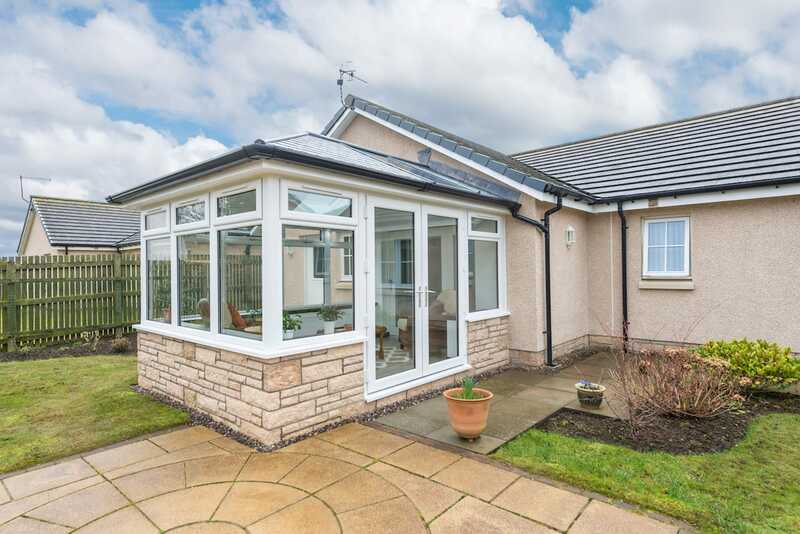 We install the Ultraroof tiled conservatory roof across Dunfermline, Edinburgh, Stirling, Perth, Dundee, Fife, Glasgow, Rosyth and surrounding areas. The Ultraroof offers a tile conservatory roof that captures a classic roof, whilst offering modern standards of thermal efficiency, security, durability, performance and weatherproofing. This is a stylish way for you to enjoy the best of both worlds. The versatility and practicality of this roof are achieved by it being the lightest, strongest tiled conservatory roof on the current market. With this in mind, it can easily be fitted onto old or new window frames and doors to serve as the perfect replacement. As all of the key components pre-cut to size, this roof can be installed sooner and easier than other solid conservatory roofs. To help minimise the overall disruption to your daily life, these roofs can be made watertight within 6 hours and bypasses the need for any cutting on site. Alongside this, all of our Ultraroofs are designed using NASA satellite data to ensure they can handle the wind and snow loads in your postcode area. You can even have 4m spans of bi-fold doors, without the need for any extra support. This tiled conservatory roof combines a fully insulated 380mm structural beam and modern manufacturing techniques to perform as a complete warm roof system. This not only allows you to enjoy a more comfortable home, you could also save money on your heating bills. With this standard achieved, you’ll be able to enjoy a warm and comfortable living area no matter what the Scottish weather throws your way. For your complete peace of mind, the Ultraroof has been tested as a completely assembled system. This means that it will be able to offer a standard of safety that is hard to find. This roof is fire rated as B-roof according to EN 13501-5: 2016, and AC according to BS476-3:2004, assuring you that you are bringing a better standard of safety to your home. To let natural light in, this roof can be fitted with full-length glazing panels. Expertly integrated into the solid roof, they will be able to help you bring a bright and spacious feel to your home without compromising the look of your property. This option is compatible with any specification of glass, allowing you to bring something personal to your home. To secure an impressive lifespan, the Ultraroof tiled conservatory roof is fitted with a comprehensive 10-year guarantee. This means that, although highly unlikely, you’ll be covered against any problems that may occur. We want to you enjoy the peace of mind that comes with knowing you are bringing lasting value into your home. Enhance the impressive aspects of the Ultraroof conservatory roof, with a choice of upgrade options. This includes Velux roof windows, which allow you to bring increased light allowance and ventilation simultaneously. You can also opt for super insulated columns or a curved cornice for beautiful, decorative value. With SRJ Windows, you’ll have the freedom to choose. 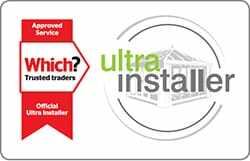 To ensure the Ultraroof looks right for you, we are able to offer a choice of tile colours for you to choose from. This includes Carbon Grey, Harvest Brown and Terra Brick. This means that, whether you want the classic tiled look, or if you want something with a modern twist, we’ll be able to offer you something that is perfect for your home and your tastes. Our Ultraroof tiled conservatory roofs can be fitted bespoke to you, which means they will prove to be the ideal fit for your home. With this in mind, you’ll be able to choose the colour of the external fascia boards, (White, Black, Rosewood or Oak), the tile colour, glazing placement as well as the material for the ridge and capping. We can offer you a roof that is suited to you. The internal insulated pelmet allows our Ultraroofs to offer you a complete ‘room-like’ feel, bringing a seamless feel between your new addition and the rest of your home. It also features an insulated cavity to help increase overall heat retention and can be used to house lighting and speaker options to bring a unique feel to your property. This also allows you to use your living area for multiple purposes. The Ultraroof is fully compliant with super insulated columns, which are the perfect way to bring a structural and comfortable feel to your home. They are inspired by the classic architecture of the Italian Renaissance and can achieve a standard of thermal efficiency that is five times more than a brick pier equivalent. This feature is a stylish way to enjoy a more comfortable home. Get in touch with us via our online quoting engine to speak to get a free, instant and competitive tiled conservatory roof quote. You can also contact us through our online contact form should you have any questions about our roofs, or you can come and visit our Fife showroom to see our collection for yourself. A member of our friendly and professional team will be on hand to show you the benefits of the Ultraroof, and how it is sure to be the ideal new addition to your home.